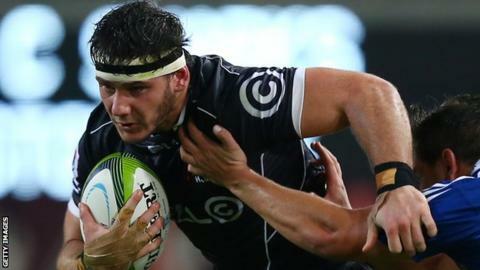 Ulster have been in contact with new signing Marcell Coetzee after he sustained a bad knee injury playing for his current club the Sharks. The South Africa back row had to be carried off during the Sharks' 24-9 Super Rugby defeat by the Lions. The 24-year-old is moving to Ulster in the summer, but his debut will now be delayed by several months. "Marcell is already taking a positive outlook," said Bryn Cunningham, Ulster's Operations Director. "He is really excited about getting fitter and stronger than ever before, to excel for Ulster next season and beyond. "I spoke with Marcell and his agent over the weekend to express our sympathy with the injury. "It was incredibly unlucky, but that is the nature of any contact sport. "We have been discussing rehab schedules and other finer details, and also an arrival time for next season, which will be finalised in the next few weeks." After being carried off on a stretcher, Coetzee was taken to hospital in Durban and Sharks coach Gary Gold said it did not look good. Coetzee, who has 28 South Africa caps, is to join Ulster on a three-year contract after the end of the Super Rugby season.